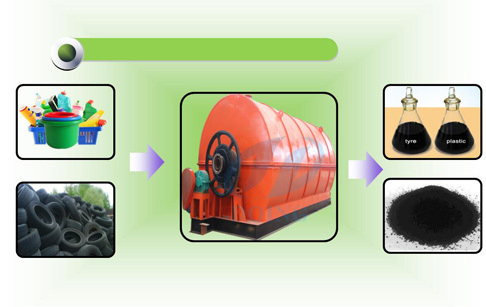 Waste tyre pyrolysis process ? Pyro = heat. Lysis = break down. Pyrolysis is chemical reaction. This reaction involves molecular breakdown of larger molecules into smaller molecules in presence of heat. Pyrolysis is also known as thermal cracking, cracking, thermolysis, depolymerization, etc. Tyre pyrolysis is: the process of converting waste tires into industrial fuels like Tire Pyrolysis Oil, Carbon Black, Steel Wire and Hydrocarbon Gas. Tyre pyrolysis involves subjecting tyre to high temperature of 400 to 450 degree Celsius, in absence of oxygen. In case of oxygen is present plastic will start burning. During pyrolysis tire breaks down into smaller molecules of pyrolysis oil, pyrolysis gas, steel wire and carbon black. Pyrolysis is a great way of recycling large amounts of tyres. This plant can also used for waste plastic recycling. Prev:Pyrolysis plastic to oil ? Next:Pyrolysis of plastic waste to oil ? If you wanna to get more details about Waste tyre pyrolysis process ? you can send E-mail to market@doinggroup.com. You can consult our professional engineer and specialized sales team with leave a message in below form.We will contact with you ASAP.You also can visit our factory in Henan,China.Get Detailed address.